The headlines about millennials are everywhere. They are money obsessed. They have unrealistic salary expectations, and poor work ethics. They are flighty. They are selfish. They love selfies. They are less likely to work for the government or for a nonprofit group. At Domtar, we don’t believe so. Yes, millennials can be ambitious; aspirational; even materialistic. But research has shown that they are also interested in sustainability. In fact, seven in ten adults consider themselves social activists. And the statistics don’t end there. While young people spend a lot of time online, it isn’t all self-promotional. In fact, 69 percent have shared information about their favorite causes on Facebook. Fifty four percent of millennials believe they’ll make a significant contribution to better the environment – and 76 percent think more highly of companies that help them support causes they care about. We believe that organizations should give their employees the chance to become sustainability champions, and harness their desire to drive positive change. That’s why in 2010 we launched the EarthChoice Ambassador program, which helps to engage employees in sustainable causes – both in and out of the office. The program’s first participants had a clear mission: to lead by example. What does that look like? Employees focus on making small changes that can ladder up to larger initiatives. For example, in Fort Mill, South Carolina, Ambassadors realized employees were using almost 30,000 styrofoam cups every year, all of which were destined for landfill. To address the issue, they provided every employee with a reusable cup. Similarly, plastic utensils were replaced with compostable, bio-based options. In Ashdown, Arkansas local schools were awarded over $15,000 in 2013 by participating in the mill’s school paper recycling program. 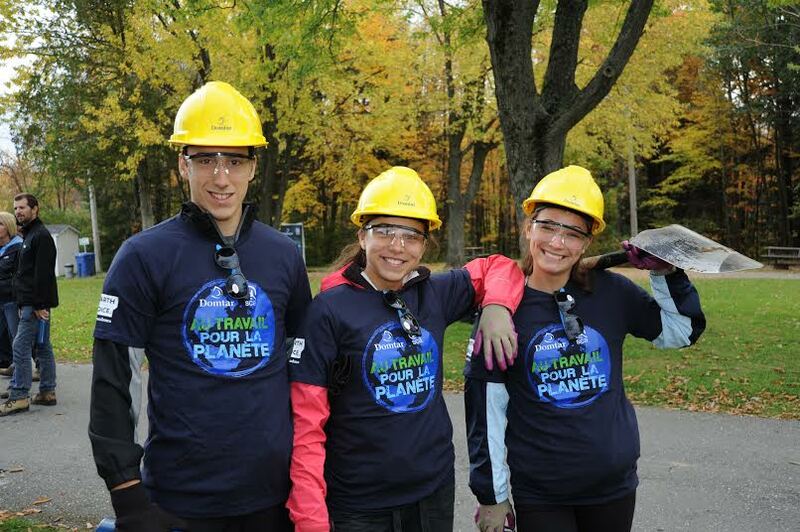 In Windsor, Quebec students plant over 5000 trees every year with the help of Domtar employees. In Raleigh, NC, Fort Mill, SC, Jesup, GA and Montreal, Quebec electronic waste recycling events are ongoing and resulted in over 500 pieces being collected in 2013. Social sustainability is core to the EarthChoice Ambassador mission. Thousands of volunteer hours are given to Domtar communities across North America each year. While the EarthChoice Ambassador program is centered on driving realistic change, it is also designed to be aspirational. Each chapter has an average 20 members who receive special recognition for their participation. For example, each member of the inaugural teams received a personalized letter from our CEO, John Williams. Each member has an EarthChoice Ambassador name plate to display in their work area. This philosophy is particularly appealing to millennials who are looking for ways to stand out and demonstrate their leadership skills. By directly involving young people in its sustainability efforts, and recognizing those who go above and beyond, Domtar encourages employees to make a long-term investment in their careers. Today, this is a rarity, as 91 percent of millennials expect to stay in a job for less than three years. Young professionals view “job hopping” as a way to move quickly up the corporate ladder, and gain new experiences and skills along the way. And the problem extends to all ages: 70% of American workers aren’t engaged in their work, according to a 2013 Gallup Study. Disengagement costs the U.S. approximately $500 billion per year, creating a serious impact on a business’ bottom line. Engaged workers report greater productivity, higher profitability and less absenteeism than their counterparts. Therefore, to retain the best talent, companies can’t just provide a paycheck; they need to offer consistent opportunities for fulfillment. At Domtar, we marry employee engagement to our larger push for sustainability. Programs like the EarthChoice Ambassadors give us the chance to repeatedly communicate our values — and act on them. Born on the bayou, Dan Persica is the Sustainability Communications Manager at Domtar, and can always make room for a fully dressed shrimp po-boy. Charged with managing EarthChoice®, the company’s industry-leading sustainability platform, he’s engaged in projects and partnerships that promote increased responsibility throughout the fiber lifecycle - from the forest to recycling. Dan enjoys cooking, organic gardening, watching the beautiful game and sampling local cuisine when traveling. If stranded on a desert island, he’d bring hand sanitizer and his hot sauce collection.